At HIGHLIGHT INDUSTRIES we believe the FANTOM FULL WEB is your best buy! USER FRIENDLY – From the ADJUSTABLE HEIGHT STEERING with COMFORTABLE FOAM GRIPS down to the four SWIVEL CASTOR BASE, it is clear that the Fantom was designed by people who care about the people who work. STRETCH SET™, our patented film tensioning system, combined with our two stage brake system ensures the film stretch to be precisely controlled. This maximizes your package strength and film economy. The two stage brake system allows the brake to be switched OFF for easy film attachment to the pallet load. Once attached the brake is switched ON to the pre-set tension. This gives the operator full control of the film stretch. PORTABILITY and MANEUVERABILITY are Fantom's two easily recognized features. The Fantom saves time by going to the load and quickly wrapping it up. 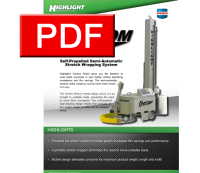 It allows you to have a wrapping station at any location in your plant. The Spiral Fantom goes anywhere to wrap anything! Comfortable foam grips, infinitely variable height adjustment using a counterbalance system, and four swivel casters – all combine to make the Spiral Fantom easy to use by virtually anyone! 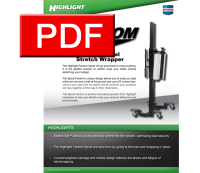 Highlight's patented film tensioning system, Stretch Set™, insures the film stretch will be precisely controlled for maximum load integrity and film economy. The Spiral Fantom's unique design allows the user to wrap loads to within an inch and a half (1½") from the ground, and spiral up to 65 inches high. The load can be unitized with the pallet, assuring the product will stay together all the way to its destination. The Spiral Fantom accepts 12" to 18" handwrap. Portability and maneuverability – the Spiral Fantom allows you to have a wrapping station at any location in your work area. Any size and any weight load can be wrapped.